It’s no big secret that the government was looking for a way to pave the way for an entirely new health reform. A cost control measure, which would save over $132 billion within a 10 year span. The government found it through the budget cuts changes they made to Medicare Advantage. In 2014, the Medicare Advantage plans available will decrease from to 2,664 plans in 2013 to 2,522,, a difference 5.3 percent, according to Avalere Health analyst. Further driving the decline of Medicare Advantage plans is the Affordable Care Act payment cuts. Beginning 2014, Medicare Advantage plans are required by law, to lower cost and use 85 percent of their revenue on medical care and quality improvement efforts. Any Medicare Advantage participants who fail to meet the requirements will be prohibited from accepting new enrollees, and their plans will be terminated after five years of non compliance. Not all news is bad for Medicare Advantage plans. Quality bonus programs have been developed to reward plans that are higher in quality and more efficient than their counterparts, reports Centers for Medicare and Medicaid. According to Peter Kongstvedt, MD, a noted insurance industry consultant and a member of MANAGED CARE’s editorial advisory board, the Medicare Advantage HMOs will do well because their rates are often below the fee-for-service equivalents and they have a track record of doing well in the past. He also believes Medicare Advantage PPOs will fare well. What does this all mean to the seniors? Under the Affordable Care Act, everyone has the right to health insurance. Do you believe “the law” will help decrease rates? With looming deadlines of October 15, for Medicare’s traditional open enrollment date, and the overlap of the first enrollment period for Patient Protection and Affordable Care Act set to start on October 1 – December 7, has caused a lot of confusion among seniors over their coverage. Adding to the confusion is the increased media frenzy reporting of the state exchanges for individuals 65 and under, and insurance companies offering coverage to both the new exchanges and to Medicare recipients. Federal health officials have stepped up the efforts to let seniors know they have nothing to worry about and that the Medicare benefits are not changing under the Affordable Care Act. They want Medicare recipients to know that the enrollment period of Oct 15th – Dec. 7th, will be business as usual and seniors will be able to sign up to new plans by continuing to go to Medicare.gov. Federal health officials have ramped up their call centers, training for Medicare counselors and website. This is in preparation to the influx of calls they will be receiving in October, in anticipation of the 50 million Medicare beneficiaries who will be mailed a handbook with a prominent Q&A, stressing their benefits aren't changing. Calls are already being rerouted to Medicare call center from the state exchanges call centers, said Julie Bataille, spokeswoman for the Centers for Medicare and Medicaid Services. Worries still linger within the senior community despite federal efforts to stem down the confusion. Under the Affordable Care Act, seniors will not be able to purchase Medicare supplemental insurance or Part D drug plans through the state exchanges. This is what worries seniors such as, 72 year old Bob Roza who actively attended meetings in order to find out what ACA was and how it would affect him and his 69 year old wife with diabetes. Roza, who underwent hip replacement this year, now worries how the ACA will affect his $614 monthly fee and his Medicare supplemental insurance, in spite of his Medicare coverage. Advocacy groups have also taken an interest on the matter. They feel the federal health officials have put most of its efforts on those who already are on Medicare and have not done enough outreach to inform seniors without Medicare, said Jodi Reid, executive director of the California Alliance for Retired Americans. She feels that advocacy groups have picked up the tab and are using the majority of their advertising dollars to inform seniors affected by the exchange. Her group has put together a one-page fact sheet to educate nearly 1 million California seniors. Officials of the AARP said they are organizing several events around the country, hosting 21 telephone town halls to clarify questions to seniors who are either Medicare or Non Medicare recipients. As the Affordable Care Act inches closer, advocates are warning seniors not to give any personal information. To watch out for scams that may surface alongside legitimate Affordable Care Act outreach. Do you feel there is still a tough job ahead to inform seniors about what the Affordable Care Act is and how it impacts Medicare? Do you believe all the outreach efforts from advocates and federal health officials will help millions of uninsured people to sign up for coverage by the end of March or will just stir more confusion? With today’s ever evolving internet technologies, its social forums, and marketing techniques, many businesses spend thousands of dollars every year on a professional website design, search engine optimization and pay per click campaigns. The effectiveness of those marketing efforts varies by company, budget and their team’s dedication toward the success of the business. However, for those smaller businesses that lack the marketing budget and dedicated team force, there are simpler techniques that can help to market their brand and garner new business or leads. Those three most important online traffic techniques for online marketing are organic search, inbound traffic and click through rate. Increase the organization online visibility by working on the Organic search. Identify keywords that tie you to your industry. Be specific and direct and avoid using generalized words. Use these words on the websites pages, headers, title, meta-tags, and within URL’s. This will help increase the website rankings through the search engine result pages (SERPS). Remember, this your single most important arsenal. Go further and optimize the website to be local, if the majority of you cliental are within your vicinity and not out of state, use news and articles that are of interest to your specific area. This will further enhance the site visibility. Start a blog. Write articles that are relevant to your industry and stay committed. This can help increase the company’s brand and make it a reputable industry leader. It will also help bring more inbound traffic to the site. Go social. Publish your latest news, releases and blogs to other social Medias; such as, Twitter, Facebook, LinkedIn, Google +, etc., and see how this will also get your business noticed through organic search. Track your inbound traffic. Find out where the traffic source is coming from. Is it coming from a search engine, forum, news, social network, maps, or online directories? All this data are great resource to have to identify areas that have successful inbound traffic, versus areas that need improvement. Hence, this information can be obtained by most web hosting companies with their web analytics programs. Check your click-through rate. Also known as calls to action or CTA’s, are the links or words user click on to do an action. Check to see how many times a call to action has been clicked on. Find out what has been working well and where there is room for improvement. Create CTA’s that engage users to fill out product forms, a poll, or direct them to a landing page that advertises a new service, special discounts or a new product. Dedication is crucial to the web marketing strategy success. Be persistent and check all organic searches, inbound traffic and click through rates. And with a little patience, those results will help market your business brand, garner new business or leads and better improve the website ranking along the way. Do you feel your business could improve by implementing three most important online traffic techniques for online marketing; organic search, inbound traffic and click through rate? UnitedHealthCare: PSM is excited to promote the 2014 UHC Proposed Plan Benefits. Don’t miss this opportunity! Coventry : At PSM, we want to ensure our agents have the resources and tools to sell successfully and provide Medicare consumers with valuable and accurate information and assistance. As the Affordability and Accountability Act inches closer to the October 1st launch date, many insurers are anticipating major changes in the regulatory and funding under the new health care reform law. With all this anticipation going around, how will the Medicare Supplement and Medicare Advantage programs be affected by the changes? For Medicare Supplement program, health care is hardly unaffected by the ACA. Under the new changes (Section 3210 of ACA), the National Association of Insurance Commissioners (NAIC) was required to add a minimal cost to the C and F plans. In December 2012, in a letter to Health and Human Services Director Kathleen Sebelius, the NAIC recommended a no cost sharing to the plans, stressing that that the additional cost would decrease usage. In May 28, 2013, the no cost sharing to plans C and F was accepted in a letter response by HHS Director Kathleen Sebelius. The Medicare Advantage program has been affected the most by the changes. The ACA holds the Med Advantage program to an 85% minimum loss ratio. It further requires the funding levels to the plans to be restructured, removing 14% overpayment to Medicare Advantage, aligning it closer to the traditional Medicare program. This in spite of the 2012 demonstration program by Centers for Medicare & Medicaid Services, which expended payments to the Medicare Advantage program and regulates the funding and cuts of program. With the regulations that the ACA has put in place for the health care reform, it has had a two-pronged road affect. The traditional plan seems to have gone unscathed, while the Med Advantage has an uphill battle adjusting it rates to the market, as well as, and being a hot topic for future political health battle grounds to come. Does the health care reform hurt the Medicare insurance industry or will it make it more competitive and affordable? 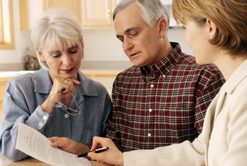 Stonebridge Life: Hot Medicare Supplement Rates Now Available for CA, OR. Also available for DE, FL, ID, KS, MI, MO, ND, NJ, NM, NV, OH, PA, SD, UT, WA.